The system of five phases was used for describing interactions and interpreting relationships between phenomena. It was employed as a device in many fields of early Chinese thought, including geomancy or feng shui, astrology, traditional Chinese medicine, music, art, military strategy, and martial arts. The system is still used as a reference in some forms of complementary and alternative medicine and martial arts, and in feng shui, fortune-telling and casting horoscopes. The Chinese character 行 (xing, hsing), though translated as “phase” or “element,” is a verb meaning “to act” or “to go.” The Five Agents were believed to control the change and movement of the universe, and to provide the energy for all the other groups of five in the Chinese cosmology, such as the Five Virtues of Confucianism, Five Government Ministers, Five Sacred Mountains of Taoism, Five Musical Notes in the pentatonic scale, and the Five Basic Colors. The source of these ancient beliefs is the I Ching (Book of Changes). Some scholars theorize that the original foundation for the five elements is the concept of the Five Cardinal Points. Each of the five agents is associated with a specific element in each group of five. For example, fire is associated with summer, red, and the Ministry of War. Wood is associated with the spring season, the color green, and the Ministry of Agriculture. The Five Sacred Mountains represent the four cardinal directions plus the center of the universe; the eastern mountain is green, the southern is red, the central mountain yellow, the northern mountain black, and the western mountain white. In Chinese history, the successive dynasties were linked to each of the five phases; the Xia dynasty (2200–1750 B.C.E.) was wood; the Shang dynasty (1750–1040 B.C.E.) was metal; the Zhou dynasty (1100–256 B.C.E.) was fire and red; and the founder of the Qin dynasty (221 B.C.E.–206 C.E.) chose black and water as his symbols. Traditional schools of the internal martial art Taijiquan relate the five elements to footwork and refer to them as five "steps." The system is still used as a reference in some forms of complementary and alternative medicine and martial arts. Some claim the original foundation for these elements are the concept of the Five Cardinal Points. 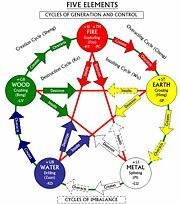 The doctrine of five phases describes two Cycles of Balance, a generating or creation (生, shēng) cycle and an overcoming or destruction (克/剋, kè) cycle of interactions between the phases. In any creative activity, such as martial arts, medicine, painting or music, each element should only be combined with the elements that come before and after it in the cycle. There are also two Cycles of Imbalance. An overacting cycle (cheng) occurs when the balance maintained in the generating sequence is disrupted, causing one element to become excessive and “overcontrol” another element. An insulting sequence (“wu,” also known as rebellious cycle, insulting cycle) operates in reverse to the overcoming sequence, when the balance between two elements is broken and the element that is usually being controlled “insults” the controlling element by overcoming it. Other common words for this cycle include "begets," "engenders," and "mothers." This cycle is also called "controls," "restrains," or "fathers." Interactions of Five Chinese Elements—Cycles of Balance and Cycles of Imbalance. According to Wu Xing theory, the structure of the cosmos mirrors the five elements. Each "element" has a complex series of associations with different aspects of nature, as can be seen in the following table. In the ancient Chinese form of geomancy known as feng shui, practitioners based their art and system on the five elements (Wu Xing). All of these elements are represented within the bagua (eight trigrams). Associated with each of these elements are colors, seasons and shapes, all of which interact with each other. Based on a particular directional energy flow from one element to the next, the interaction can be expansive, destructive, or exhaustive. Proper knowledge of these principles of energy flow enables feng shui practitioners to apply specific cures by rearrangement of energy in a way they believe to be beneficial. 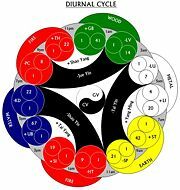 The interdependence of organ networks in the body was noted to be a circle of five majpr systems, and was mapped by Chinese doctors onto the five phases. For instance, the liver (wood phase) is said to be the "mother" of the heart (fire phase), and the kidneys (water phase) the “mother” of the liver. In the case of a kidney deficiency affecting the function of the liver, the observation is made that the "mother" is weak, and cannot support the child. However, the kidneys (water phase) control the heart (fire phase) in the “overcoming” (“ke”) cycle, so the kidneys are said to restrain the heart. Many of these interactions have now been linked to known physiological pathways (such as the pH of the kidney affecting activity of the heart). The application of the five elements in Chinese medicine is only a model, with some known exceptions, but because it seems to produce valid results, it has remained in use for thousands of years. These two orders are further related to the sequence of the planets going outward from the sun (Mercury, Venus, Mars, Jupiter, Saturn; or Water, Metal, Fire, Wood, and Earth) illustrated in a star diagram similar to the one shown above. Chinese astrology is based upon the interaction of the five elements with the twelve signs of the Chinese zodiac, to produce a 60 year cycle of signs. A 60th birthday celebration is especially significant because the person has lived through a complete cycle of 60 years. For example, someone born in the year 1953, the year of the Snake, is said to be born in the year of the Water Snake because his or her birth year ends with 3, a number associated with Water. Fortune-tellers use these associations in determining whether a couple will have a fortuitous marriage. The Chinese word 青 qīng, traditionally translated as azure in this context, includes the range in the spectrum from green to blue, with shades down to black. In modern Western music, various seven note or five note scales (for example, the major scale) are defined by selecting seven or five frequencies from the set of twelve semi-tones in the Equal tempered tuning. The Chinese "lǜ" tuning is closest to the ancient Greek tuning of Pythagoras. The martial art Xingyiquan uses the five elements to metaphorically represent five different states of combat. Xingyiquan practitioners use the five elements as an interpretative framework for reacting and responding to attacks. The five element theory is a general combat formula which assumes at least three outcomes of a fight; the constructive, the neutral, and the destructive. Xingyiquan students train to react to and execute specific techniques in such a way that a desirable cycle will form based on the constructive, neutral and destructive interactions of five element theory. Where to aim, where to hit and with what technique—and how those motions should work defensively—is determined by the point of the cycle in which the combatant sees himself or herself. Each of the elements has variant applications that allow it to be used to defend against all of the elements (including itself), so any set sequences are entirely arbitrary, though the destructive cycle is often taught to beginners as it is easier to visualize and consists of easier applications. Shan shui (Chinese: 山水 lit. "mountain-water") is a style of Chinese painting that involves or depicts scenery or natural landscapes, using a brush and ink rather than more conventional paints. Mountains, rivers and often waterfalls are prominent in this art form. Shan shui is painted and designed in accordance with Chinese elemental theory, with the five elements representing various parts of the natural world, and has specific directions for colorations that should be used in cardinal 'directions' of the painting, and for which color should dominate. Elements that react positively should be used together. For example, Water complements both Metal and Wood; therefore, a painter would combine blue and green or blue and white. There is a positive interaction between Earth and Fire, so a painter would mix Yellow and Red. Elements that interact negatively should never be used together. For example, Fire will not interact positively with Water or Metal so a painter would not choose to mix red and blue, or red and white. ↑ Dorothy Perkins, Encyclopedia of China: The Essential Reference to China, its History and Culture (New York: Facts on File, 1999), 161. ↑ Acupuncture, The Five Elements. Retrieved January 20, 2009. ↑ Northern Shaolin Academy, Chinese Five Elements Chart. Retrieved January 20, 2009. ↑ Susan Bush, Early Chinese Texts on Painting. ↑ Chiang Yee and S.I. Hsiung, The Chinese Eye: An interpretation of Chinese Painting (Indiana University Press, 1964). ↑ Textual Evidence for the Secular Arts of China in the Period from Liu Sung through Sui by Alexander Soper. Bush, Susan, and Hsio-yen Shih. Early Chinese Texts on Painting by Chinese Literature: Essays, Articles, Reviews. 1985. Feng, Youlan (Yu-lan Fung). A History of Chinese Philosophy. 1952. Needham, Joseph. Science and Civilization in China. 1954. Maciocia, G. The Foundations of Chinese Medicine, 2nd ed. London: Elsevier Ltd., 2005. ISBN 9780443039805. Perkins, Dorothy. 1999. Encyclopedia of China: The Essential Reference to China, its History and Culture. New York: Facts on File, 1999. ISBN 9780816026937. Soper, Alexander Coburn. Textual Evidence for the Secular Arts of China in the Period From Liu Sung Through Sui (A.D. 420-618). Excluding Treatises on Painting. Artibus Asiae, 24. Ascona: Artibus Asiae Publishers, 1967. All links retrieved August 1, 2013. Five Element Information Five Element interrelationships, concordances and causative factors. Chinese Zodiac Chart Find your Chinese Zodiac sign based on your date of birth. This page was last modified on 1 August 2013, at 23:00.